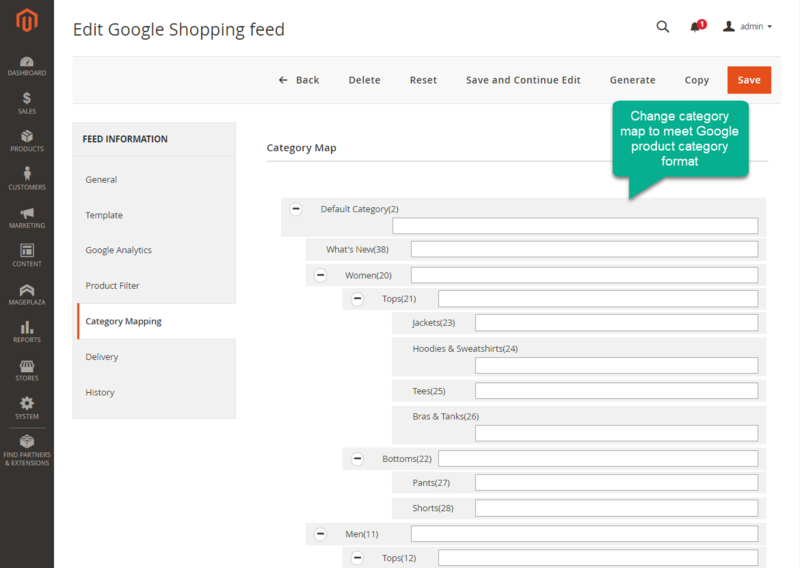 Magento 2 Product Feed extension works as a communication tool among your online store and other shopping channels like Google Shopping, Amazon, eBay, Bing, and Facebook. 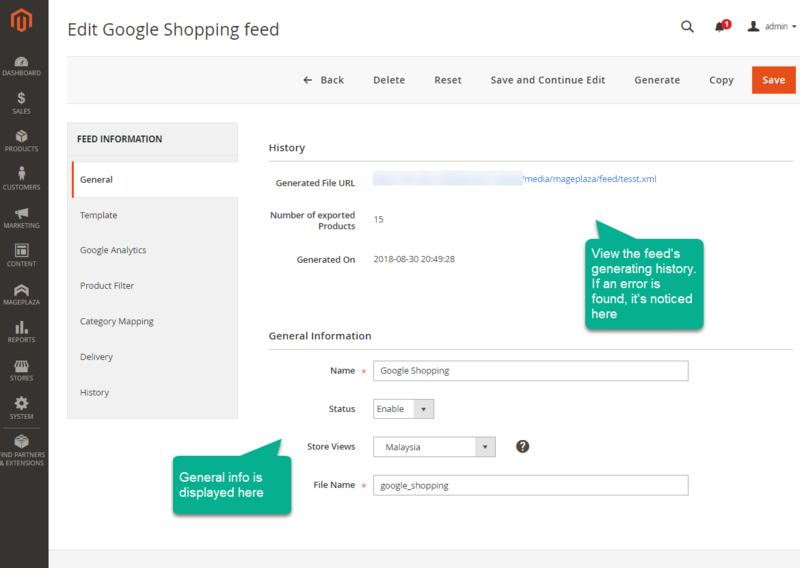 This module helps to generate, upload and operate product feeds on other shopping engines. Hence, this brings more exposure opportunities, attract more customers and drive big sales for your store. A product feed which is also known as a product data feed is a file containing all the information of the products on your online store. The information can be product names, SKUs, attributes or other marketing materials. 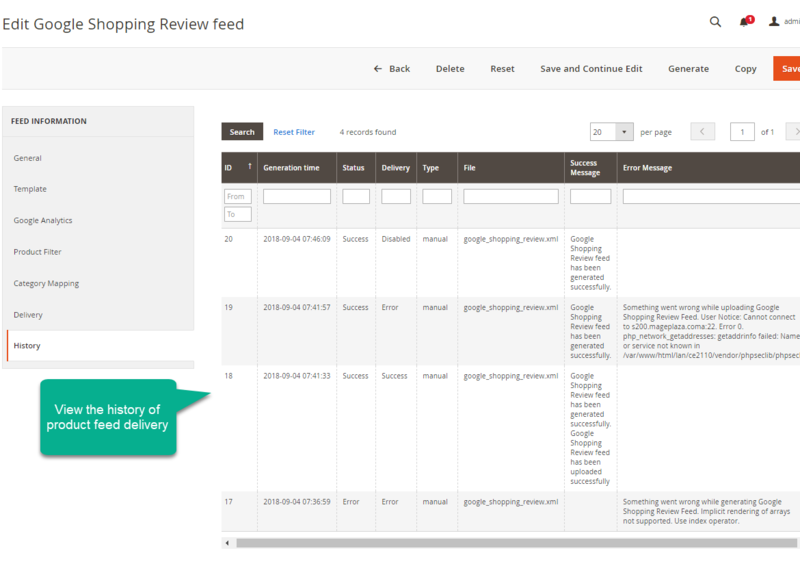 A product feed is stored in a TXT, XML or CSV file. Products feeds are perceived as a common language which helps your store communicate with other shopping engines that you sell your products on. A product that you sell at your store contains a big amount of data. These data are generated and updated on a regular basis. If you consider selling your products on one or more shopping channels such as Google Shopping, Bing, eBay, Amazon or Facebook, that you have to update this information manually consumes a massive amount of time, yet causes inaccuracy. 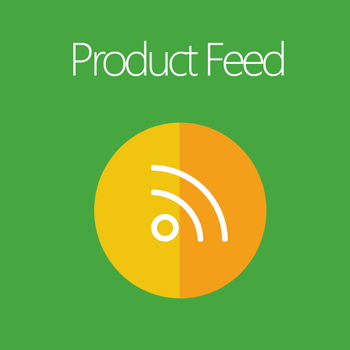 This is the most important reason why you need product feeds. Besides, product feeds also guarantee the consistency of products’ information across all selling channels you join, boost your exposure opportunities on these shopping engines, and consequently attract new customers. You do not have to spend days to get product feeds generated and updated manually because an auto feed generator can make it done instantly. 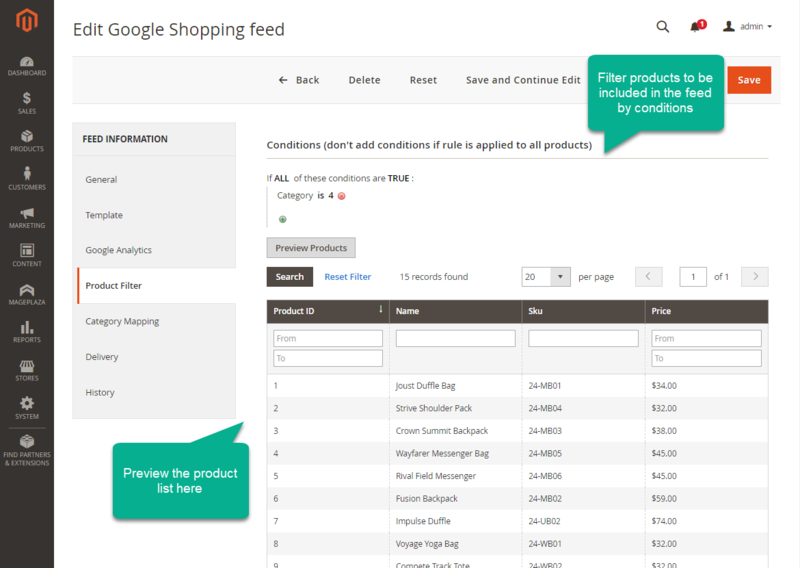 The product feed generator can help you enhance the accuracy of the information of products compared to doing this manually. Also, that all the information is generated and updated systematically helps it be consistent among other shopping channels. 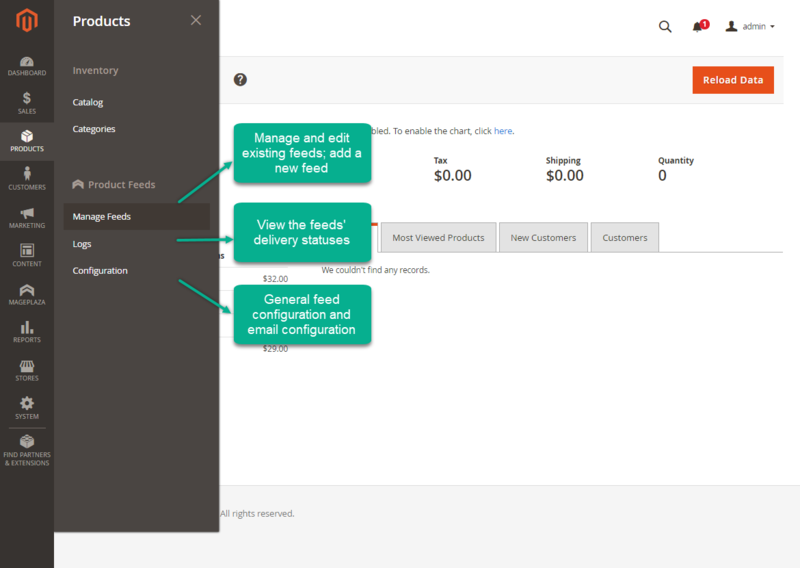 Product Feed extension makes it easier for store owners to track, control and manage all the generating process. With the support of Google Analytics, online stores can even assess the performance of their products on other channels and measure the effectiveness of each campaign. 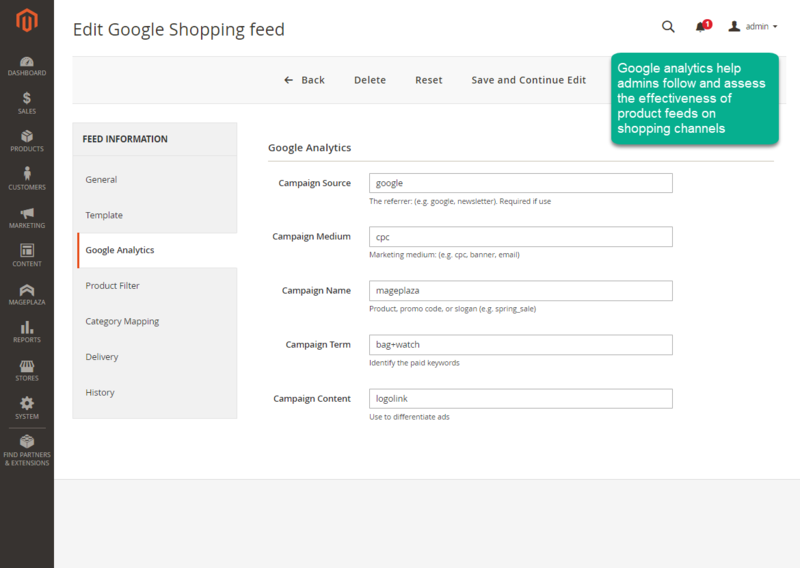 Product data feed generator supports the 3 most popular file types which are readable by Google, Bing, eBay, Amazon and other selling machines. This increases the chance for your products to approach new customers. Other most used shopping search engines. These templates can be easily edited by inserting variables into the backend. All formats of the frequently used variables are presented to make it easier for admins to apply. 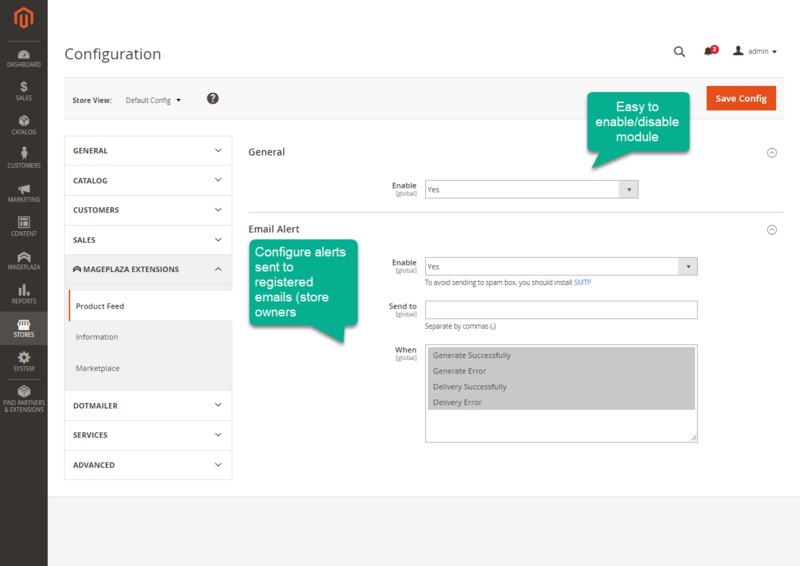 It is no big deal to generate and customize a product feed template on the backend. To create a new template, admins only need to insert default Magento variables into the content. To make this easier for template creators, a library of usable variables is supported. Templates which are created by Product Feed extension for Magento 2 are friendly with any shopping search engines. Also, the templates can be customizable in Liquid which gives admins no restriction in template generation. 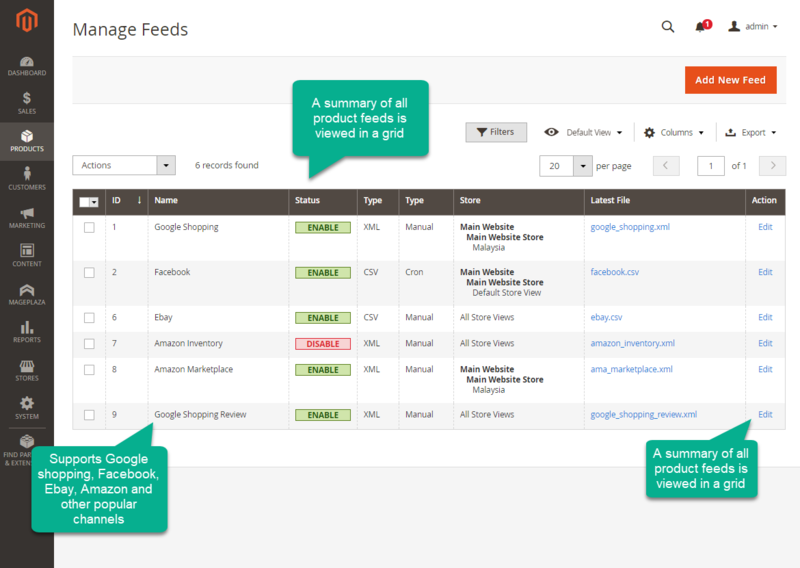 Magento 2 Product Feed by Mageplaza allows delivering product feeds automatically to other compatible marketplaces, selling channels and shopping searched engines. Applying a new technology, the extension uploads the data much faster via FTP or SFTP. FTP/SFTP details can be collected easily through marketplace merchant accounts. 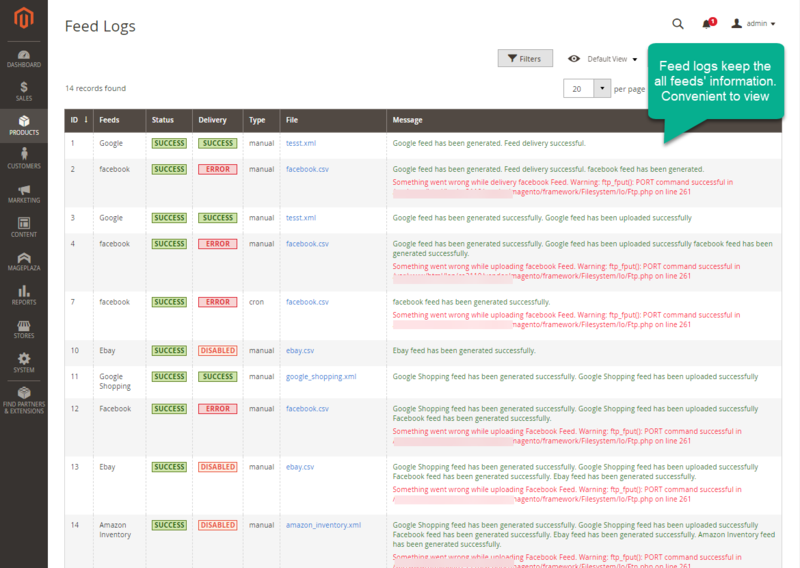 The rest of the work is simply done on the backend with some single clicks. Also, a public URL can be generated to make it easier for other shopping engines to access the feed. 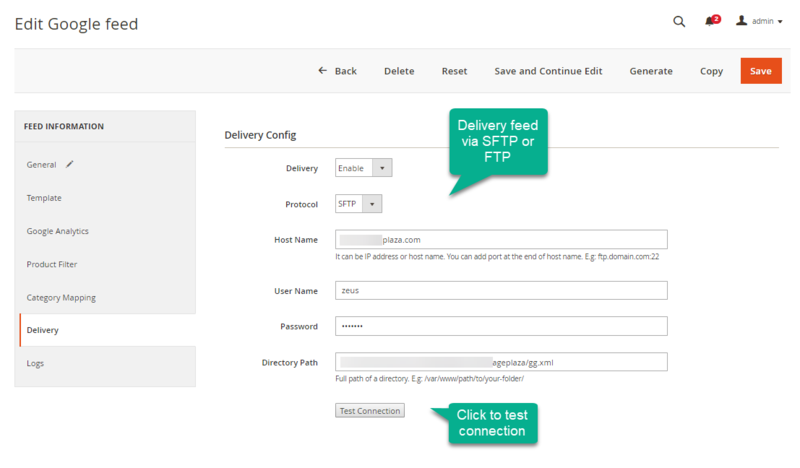 Product feed delivery time is configurable. Admins can manually upload the feed or let it done automatically. Product feeds can be delivered on a daily, weekly or monthly basis. Filter products by rules to add to product feeds. Load to preview products which meet all conditions. 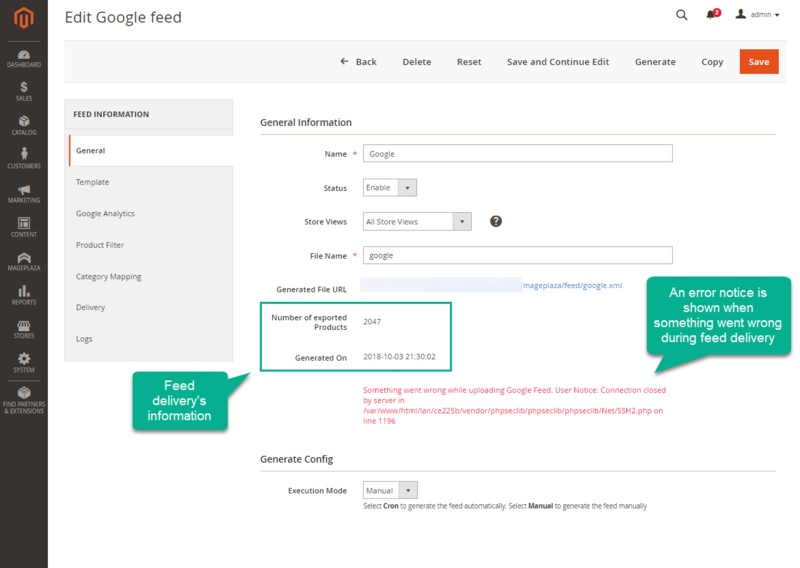 Send email notification to admins for the feed generation process and delivery status. Filter products by attributes, attribute set, category, SKU. 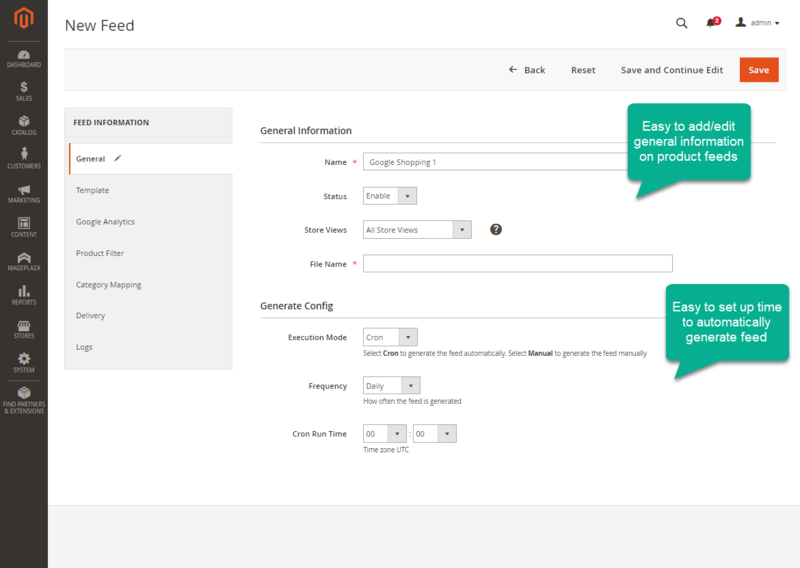 Compatible with Mageplaza extension: Ajax Search, Required Login, Product reviews, etc. filter_drama I have products on a shopping channel, how do I know if your extension supports the appropriate template? You can check the feed templates that work for this shopping channel first. If this channel requires TXT, XML or CSV files, our extension absolutely suits. filter_drama I want to format products’ prices in a feed template. Is it possible? Some bug fixing was needed to make it 100% Google Shopping compatible but their support helped with no additional cost unlike other extension providers that do zero customization and extra fixing. Excellent and professional service with Product Feed module. Erik was very kind and patient to help me. Thank you, Mageplaza! Does exactly what it says. Highly configurable, fast, and reliable. I certainly recommend it if you're trying to integrate with Google, Amazon, Facebook, or if you need your own feed in your own format. Hello. We were up and running with this plug in in about 30 minutes. Very easy to add and use. All feeds seem to do the trick. Highly recommended add on. After I apply Product Feed, I have introduced my products to many popular shopping channels easily, mainly Google Shopping, eBay, Amazon, Facebook with ease. Any updates to information are totally automatic and quick. Just for one month after the installation, my store's sales have increased amazingly. I really appreciate! The Product Feed extension is a really good choice for my arsenal. I'm looking for a Google Feed extension, Amazon or any other of your own making. This is the best! Thank you. This extension is so good for the Product Feed. And it is also an awesome extension for the Google Feed. Thank you for developing this module!